Family and friends of 11-year-old Damian Solis are in mourning after a driver struck and killed him on a dangerous road, but the Colorado State Patrol is laying blame at the feet of the victim. 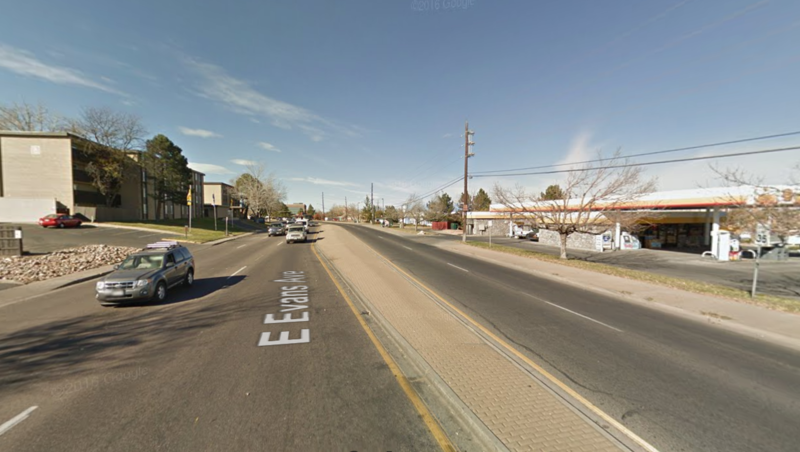 On Monday night, Maria Yurivilca, 45, drove into Solis with her SUV near Quebec Street and Evans Avenue, just on the edge of southeast Denver in unincorporated Arapahoe County. This loss is horrific for our community. Damian was smart, he was witty, and he had an enormous heart. He loved insects, Big Foot, and all things science; he made the silliest faces. He had a vast imagination that sparked incredibly creative stories. We know we will miss Damian every day. Just before 8 p.m. on Monday, Solis had visited a Shell gas station convenience store with another boy, and proceed to an apartment complex on the other side of the street, Colorado State Trooper Nate Reed said. Halfway across, Solis stepped off the raised concrete median between stopped cars queuing to turn left. He continued to the middle lane, where the driver struck and killed him. Reed was sure to tell Streetsblog and other media outlets that Solis was “wearing dark clothing” and crossing mid-block. “Instead of going 250 feet to the east, they decided to cross right where they were,” Reed said. The area where Solis crossed was unlit by streetlights, he added. Meanwhile, we still don’t know exactly how fast Yurivilca was going — that’s something the investigation will reveal through the on-board computer, Reed said. She’s not facing any charges. The block where Solis was struck is a disaster waiting to happen. There are houses and stores, but the street is designed for high traffic speeds and the posted limit is 35 mph — not a safe driving speed for an area where people walk. That’s why Seattle, for example, is lowering speed limits to 20 mph on residential streets. Half of the intersection is in Denver, the other half is in unincorporated Arapahoe County. The Denver Police Department said officers have worked 56 crashes at the intersection in the past seven years. Denver Public Works and Arapahoe County officials said the Colorado Department of Transportation is responsible for any safety improvements at the intersection. While support for a median barrier and more signage is growing, investigators stress nothing illegal such as speeding or alcohol is suspected in Monday’s crash. But troopers said that hasn’t always been the case. CDOT said the city of Denver and Arapahoe County share responsibility on safety improvements to the intersection. To review: A child has been killed in an area that officials know to be deadly. To have government reps tell it, no one is responsible except Solis, who is gone. Naturally, their answer is to erect a barrier to stop people from crossing the street, instead of calming traffic and creating safer crossings. You can throw CDOT under the bus for this if you would like but CDOT has literally no jurisdiction on either Evans or Quebec. Neither road is a state highway and CDOT can’t force Denver or Arapahoe county to do a thing. CDOT has little control over Evans, the road is a primary freight artery under the FHWA FAST Act and MAP-21, as well as a CDOT freight route, all the way from Federal to I-225. What part does parenting play in this? Learning how to “look both ways before crossing” was something that was drilled into my head as a kid . . .
Compounding the issue is wearing dark-colored clothing at 7:50 pm creates an extremely hazardous situation. As drivers we automatically learn to be aware of larger car-sized and bigger things partly to the detriment of smaller things like pedestrians, motorcycles and bikes. Wow, even on streetsblog, the car apologists come out in the comments. Well, we know where to put the blood of this little boy. Evans is not a residential street, it is a Federally-regulated primary artery under FHWA MAP-21 law and a heavy truck route. The speed limit is perfectly normal for the type of road. There was a crosswalk 250 feet away. What do you want, a stoplight every 250 feet? What you want is gridlock. How about we fault whoever thought building apartments on a primary heavy truck route was a good idea?